Weaver® W-Pro10 Blue Certified Overhead 2 Post Lift - Derek Weaver Company, Inc.
For warehouse pick up at our North Carolina or Texas warehouse Call for pick up price ($2549.00), make payment and schedule a pick up appointment. 1) The W-Pro10 is manufactured for Weaver® Lift by the VSG subsidiary of the Fortune 500 Dover Corp. (NYSE:DOV) Based Here, Certified Here and Insured Here in the USA. VSG/Dover is the Largest Lift Manufacturer in the World and enjoys over 80% market share of the car dealer business in this country. Why? Because they take care of business, before, during and especially after the sale. You simply cannot get the "Peace Of Mind" from any other lift manufacturer that you have when you own a VSG/Dover product. *VSG/Dover has "Hundreds of Thousands" of lifts and service racks installed in vehicle repair shops worldwide. Currently selling over 50,000 units per year. More than any other manufacturer. 2) The W-Pro10 has VSG/Dover and Weaver® Lift's best features blended into one Fabulous Design at a new level of affordability. Don't buy a 2-post Lift that has to be installed either asymmetric or symmetric...The W-Pro10 installs Super-Symmetric to do both asymmetric and symmetric with more room between the columns. VSG's Push Style Direct-Drive Cylinders and 2-Piece Rotary Column design for Adjustability in Width and Height. VSG's Strong Column, Oversized Carriages and Arms. Weaver® Lift's Reliable Power Unit and Complete Stack Adapter/Lift Pad Set with a 3 5/8" Low Pad Height. 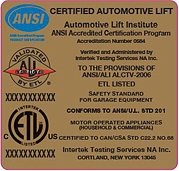 3) The Weaver® Lift W-Pro10 (PL10N000) is Certified to the rigid OSHA recognized ANSI/ALI ALCTV-2011 USA automotive lift standard. To validate this claim, ALI requires the lift to be 3rd party tested by the nationally recognized ETL testing lab (Intertek) and engineers. The W-Pro10 passed this validation process and has earned the right to wear the ALI/ETL Gold Label. Your insurance company will like this. 4) Parts, Warranty and Support remain unmatched in this industry. VSG/Dover backs their products with a great warranty and support team that no other lift company can come close to. The majority of car dealers know this and enjoy the "Peace of Mind" that comes with owning a VSG/Dover product. The VSG/Dover parts delivery system is a 7 Tower REMSTAR computerized storage system worth over 7 million dollars. This parts system rivals that of most car companies. Their commitment to the customer cannot be matched. The W-Pro10 has a 5-Year Structural Warranty and a 1-Year Parts Warranty. 5) Also known across the country for our outstanding customer service, the W-Pro10 is sold and supported by Derek Weaver Company. States Derek, "Our new W-Pro10 has quickly become our best selling 10,000-lb. 2-post lift. The acceptance of this new lift model for us and our customers has been...well, a No Brainer. The quality that is being manufactured by VSG/Dover shines in every aspect of the W-Pro10. Noticeable quality is found in every detail, from the packaging, the manual, the installation, ease of operation, service and parts availability, the certification, the insurance,...etc., simply does not compare to any other lift in it's class. At this price level there is really no comparison. The benchmark has been raised and the price just got lowered." Super Symmetric Lift Arms – 3 stage offset front arms and 2 stage rear arms allow both asymmetric and symmetric lifting methods. Oversized carriages spread the load out across the column to reduce the overall load on the lift. Adjustable Height Columns allow fit under a 12’ ceiling or an additional 6”. Adjustable Column Width provides 6” adjustment for narrow service bays. One of the Lowest Lifting Pad Heights starting at only 3 5/8"
Stackable Height Adapters in 3 sizes, 1 3/4”, 3 1/2" and 5" heights (4 Each). Single Point Lock Release to unlock both columns from one side. Heavy Duty Arm Restraint System with oversized steel gears, pins and springs for trouble free operation. Swing Arm Restraints Automatic Locking Above 2 1/2"
Now, lift buyers that need a 10,000-lb. capacity Car Lift can buy the Certified W-Pro10 at aNon-Certified Price. Overall Floor Width: 137" or 131"
Overall Height: 143" or 149"
MIN. Floor to Ceiling Height: 150” or 144"
Floor to Overhead Shut-Off Switch: 143-5/8” or 137-5/8"
Lifting Height w/ 5"Adapter 76 5/8"
Low Pad Height: 3 5/8"
Pad Height W/ 1 3/4" Adapter 5-3/8"
Pad Height W/ 3 1/2" Adapter 7-1/8"
Pad Height W/ 5" Adapter 8 5/8"
Column Size - 11" x 7"
Width Between Columns: 115" or 109"
Width Between Carriages: 113” or 107"
Drive Thru: 105" or 99"
Base Plate: 16.5" X 18"
The Weaver® Lift W-Pro10 is proudly manufactured by Dover Corp.'s Vehicle Service Group (VSG). VSG comprises nine major vehicle lifting and collision repair brands: Rotary Lift, Chief®Automotive Technologies, Forward® Lift, Direct-Lift®, Hanmecson®, Revolution® Lift, Elektron, Blitz® and nogra®. Based in Madison, Ind., VSG has operations worldwide, including ISO 9001-certified manufacturing centers in the U.S., Europe and Asia. It's been installed for about 10 months now and no issues with daily professional use. I doubt it will go 35 years like the lift it replaced but if it makes it 10 years I'll be satisfied. We installed it ourselves with no experience and it shouldn't be an issue for someone with a mechanical background. We recently lost another 30 year old hoist and bought another of this model so obviously we liked the first one. Replaced an old lift in my shop with this lift - had to get online and perform a bleed procedure on the hydraulics - after that it performs wonderfully - very pleased with this lift - great product and value! I did a lot of research before buying this lift including going to see other brands in person. I started off looking at less expensive models and on paper and in the ads they are appealing until you see them in person. In the end I decided to go with the Weaver Pro10 and couldn’t be happier. The build quality and certification put this lift in a class by itself. The assemetric arms work really well and free up floor space when folded back and not in use. So far lift has been a benificial asset to garage. Install went good but instructions could have a few more details. Thanks for fast service and friendly help when calling. Good price for certified lift!! W-Pro10 Loads both Asymmetric and Symmetric with our Flexible Offset Arm Style. Weaver® W-Pro10 Blue - With Arms Spread Open for Symmetric Loading. Weaver Lift W-Pro10 Lifting Pads with Included Height Adapters starting with a low pad height of only 3 5/8". Various Height Adapters Included (4 each) 1/1/2", 3" and 6"
Offset 3-Stage Front Arms provide maximum flexibility with easy reach and loading for both symmetric and asymmetric vehicles. Single Point Safety Lock release handle allows complete operation from the Power Column.